Congress MP and Congress President Rahul Gandhi slammed Indian Law Minister Shri Ravi Shankar Prasad over the topic of pending cases in Supreme Court, High Court and Lower court. Rahul Gandhi tweet a photo by saying,”oh! No, Milord!. In this photo, he mentions the actual status of Supreme court. According to reports, there are registered 30% cases more than five years old. More than 55,000 cases are pending in Supreme Court while 37 lakh plus cases are pending in High Court yet. According to figures collected by the Ministry of Law, the Supreme court had 62,791 pending cases at the end of 2014. The numbers fell to 59,272 in December 2015, At the end of 2016, the number of cases left in the Supreme Court rose to 62,537. The ministry said, according to latest data provided by the Supreme Court, as on July 17, 2017, the pending cases have been fastened at 58,438. These include 48,772 civil and 9,666 criminal cases. Rahul Gandhi wrote on his wall,” Yet a Staggering 400 High Court and 600 Lower courts not appointed yet, while Law Minister Ravi Shankar Prasad preoccupied peddling fake news.” Indian Judiciary is totally demonetised, he also added. 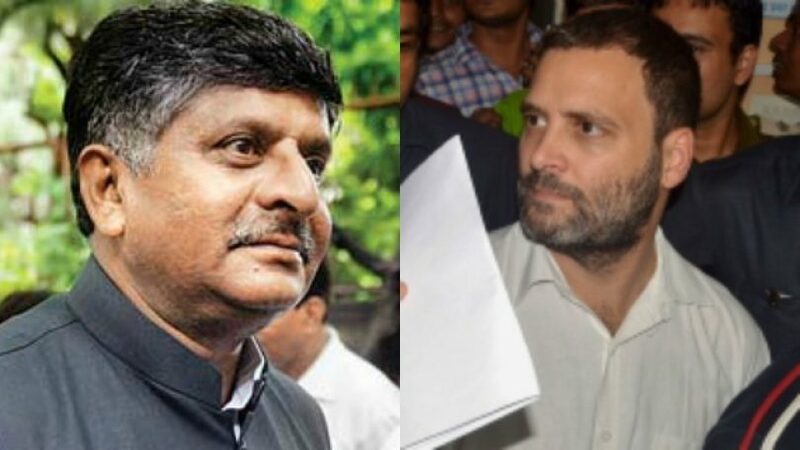 Indian Law Minister Ravi Shankar Prasad had recently attacked Rahul over the controversy encompassing Cambridge Analytica, where the Bhartiya Janta Party alleged over Congress that there was a link between the Congress party and Cambridge Analytica to influence India’s electoral process through undesirable means. “What link does Cambridge Analytica have with social media management of Rahul Gandhi and Congress Party?” he said. Congress President Rahul Gandhi was countering on Ravi Shankar Prasad by saying that BJP has accused the central government of diverting the people’s attention from the news of the death of 39 Indians in Mosul as it has allegedly been caught lying.Congress Supremo at presently is busy in Karnataka for promoting the upcoming Assembly elections, which has been scheduled in 2018. Hrithik Roshan and Katrina Kaif to team up for ‘Bang Bang’ sequel?